Vesta (Greek Mythology: Hestia) Roman goddess of the hearth, and domestic architecture and governance. This is a popular mask which formed the centrepiece of numerous eighteenth-century chimneypieces including this piece from the Red Drawing Room at Castletown House, Co. Kildare. Fire of course is an age old symbol of life, and the Vestal Virgins were the keepers of the eternal fire of Rome. 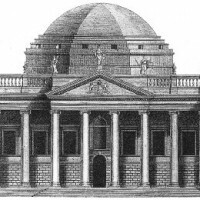 This piece was designed by Sir William Chambers and appeared in his 1759 publication A Treatise on Civic Architecture, a copy of which was at Castletown. Drapery swags from which a central facial mask is revealed continue outwards to wrap around the flanking cruciform border through which they protrude via stylised acanthus masks in an altogether symmetrical scheme. 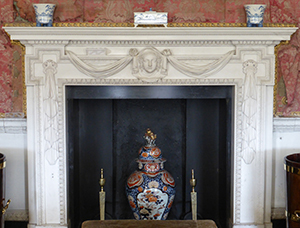 Lady Louisa Conolly, wife of Squire Thomas and mistress of Castletown, mentioned this chimneypiece when she wrote to her sister Lady Sarah in February 1768, ‘Our chimney pieces are come over, therefore we shall soon furnish our House, which will be a great diversion to me’. The chimneypieces referred to were made in London and transported to Castletown to adorn the newly remodelled reception rooms. 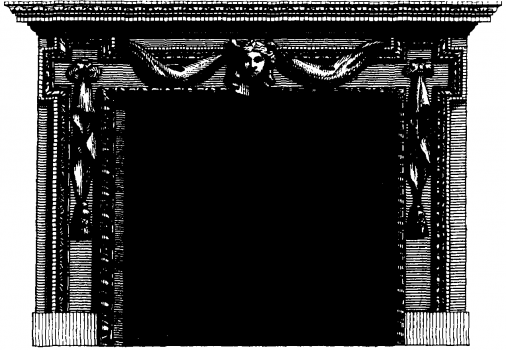 A similar design appeared in Isaac Ware’s Designs of Inigo Jones and Others in 1731, in which the vertical swags are tied at their finals and the head on the central mask is more exposed, and William Kent also employed this design in Holkham Hall, Norfolk for Thomas Coke first Earl of Leicester. In Ireland this design was used in Lord Kildare’s Dublin townhouse (now Leinster House), his country seat at Carton House, and No.6 South Leinster Street which was built c1760 for Attorney General Philip Tisdall. 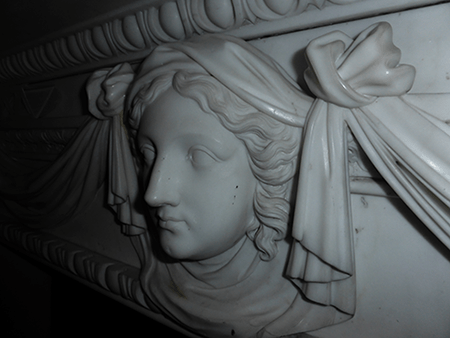 At Castletown, the image of Vesta also appears in the stuccowork on the walls of the staircase hall, sculpted-in-situ by Filippo Lafranchini in the 1760s. Inspiration for the stucco masks may have been found in contemporary publications such as Bernard de Montfaucon’s L’antiquit Expliquee, a book that is believed to have had an influence on the Lafranchini stuccowork in the Apollo room at 85 St. Stephens Green. In Ancient Rome, the design of a temple dedicated to Vesta was governed by the principles of the Corinthian order; therefore it is little surprise that the figures at Castletown reside in rooms whose cornices are that of the Corinthian. 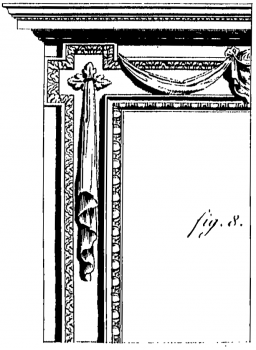 Could this be the signature of William Chambers and his dogmatic approach to neo-classical design? That the subject of the mask is Vesta is indicated through the lack of iconography accompanying the piece, the context in which it is used, and the cloaking of the mask. Vesta watches over the fire which represents the life and wellbeing of Castletown and its inhabitants, and she can be read as an exceptional domestic governess for the young Lady Louisa to aspire to. Elsewhere at Castletown masks are identifiable through their accompanying symbols; Hercules rests above the first floor doorway in the staircase hall, identified by his lion pelt, and illustrates the strength through which said governance can be achieved.